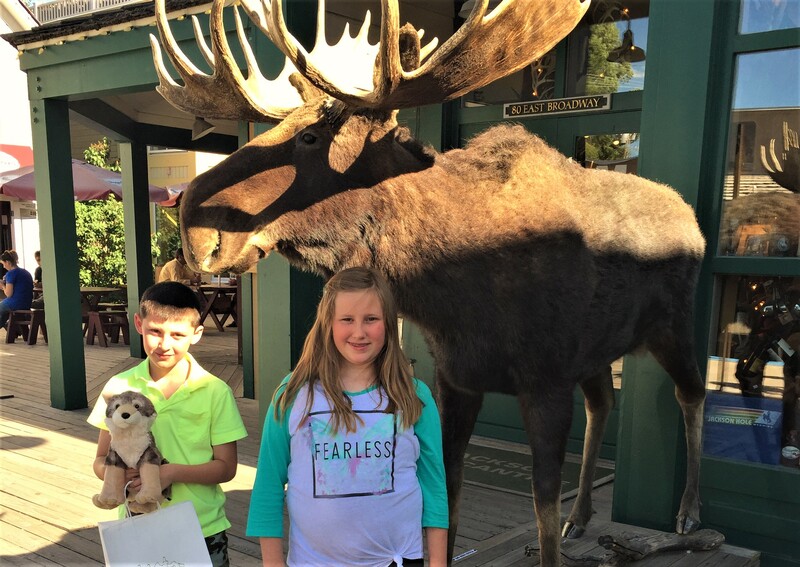 Visiting the town of Jackson Hole, Wyoming, is like taking a trip into the Old West, with a little modern day shopping included. At the center of it all is the town square, where you can watch a shootout, take a ride in a stagecoach, or enjoy the many entertainers performing around the square. This little town is packed with so much to do that it was hard to decide what to fit into one day. We love to eat out for breakfast. Not only do we love breakfast fare, but it is usually a little cheaper for our family of four. 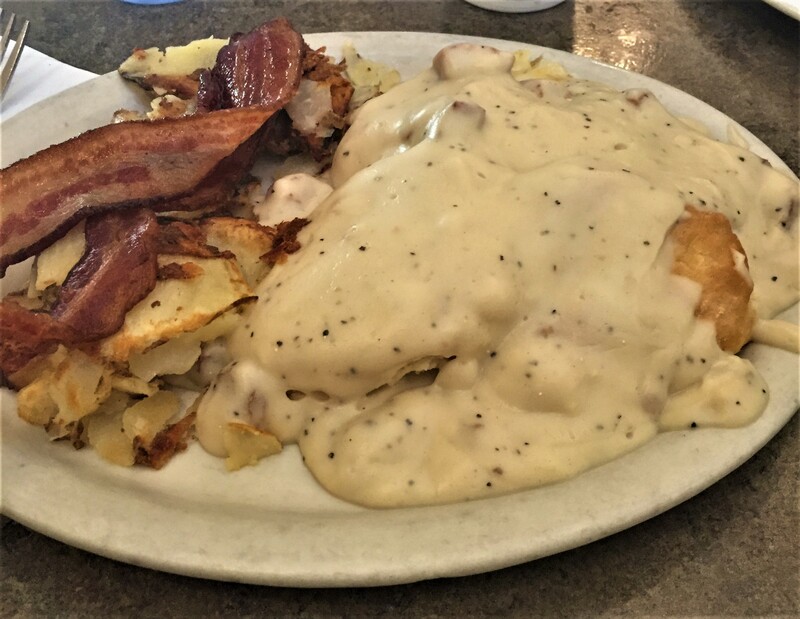 The morning we visited Jackson we chose The Virginian, and it did not disappoint! The kids each got a pancake. 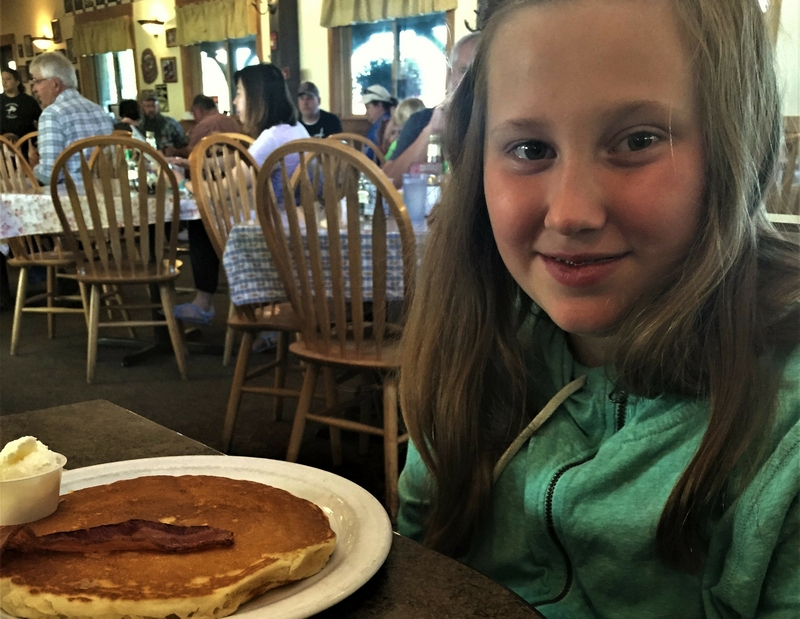 They were kind of concerned with just getting one pancake…until it came out and it was the size of the plate! I got their famous biscuits and gravy, hash browns and bacon. Not the healthiest meal on the menu, but it sure was delicious. Blaine stuck with the old standby of eggs, bacon and a biscuit. After eating so much food, we were quite stuffed, but still ready to go and explore. Our next stop was the Jackson Hole & Greater Yellowstone Visitor Center. We were surprised upon entering to find out this is also the visitor center for the National Elk Refuge. If you are looking for information on the Jackson Hole area, this is the place to go. But don’t think this is “just” a place to get travel assistance. There are interpretive displays and educational programs about elk, the elk refuge and other wildlife found in the area. The kids enjoyed completing the Blue Goose Jr. Ranger Activity book. After walking through all of the exhibits and enjoying the view from the outdoor deck overlooking the National Elk Refuge, the kids turned in their booklets. 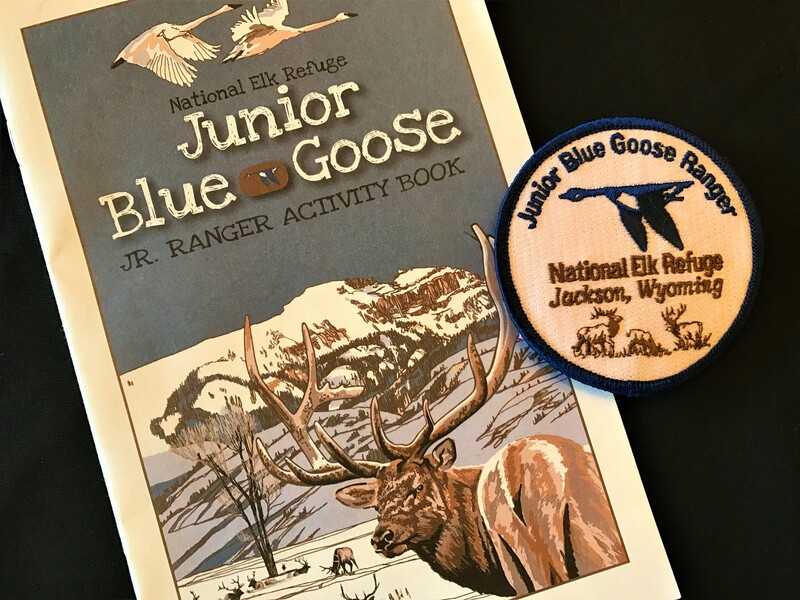 They said a pledge to respect the wildlife and habitats of the National Elk Refuge and were given a Jr. Ranger patch. This was a fun and educational stop, as well as budget friendly. After our visit, we headed back to our RV for a little rest and to eat lunch. We stayed at Fireside Resort-Buffalo Valley in Moran, Wyoming. The 45 minute drive from the RV park to town was beautiful and we got to see lots of wildlife, so making the trip back and forth was not a hardship. When we returned to Jackson, we went back to the center of town, walked along the wooden boardwalks and did a little shopping. There are many photo galleries, art galleries and tourist shops filling the blocks around the square. Two of our favorites were the Mangelsen Images of Nature Gallery and Teton Toys. These two stops were polar opposites. While visiting the gallery, we were amazed by the beautiful images of nature caught by Thomas D. Mangelsen, one of the world’s premier nature photographers. The kids loved viewing all of his photographs, particularly the ones of wildlife. We were sure to keep the kids by our side, because we were afraid someone would touch something they should not, but the worry was worth it! After visiting several more stores and doing a little window shopping, we stumbled across Teton Toys. The kids loved this store, and we did not have to worry about them touching anything. There were toys out for them to play with, and they particularly loved the large selection of stuffed animals depicting local wildlife. Of course, the kids could not leave without purchasing a stuffed gray wolf and an elk. When we finished shopping, we walked across the street to the square. 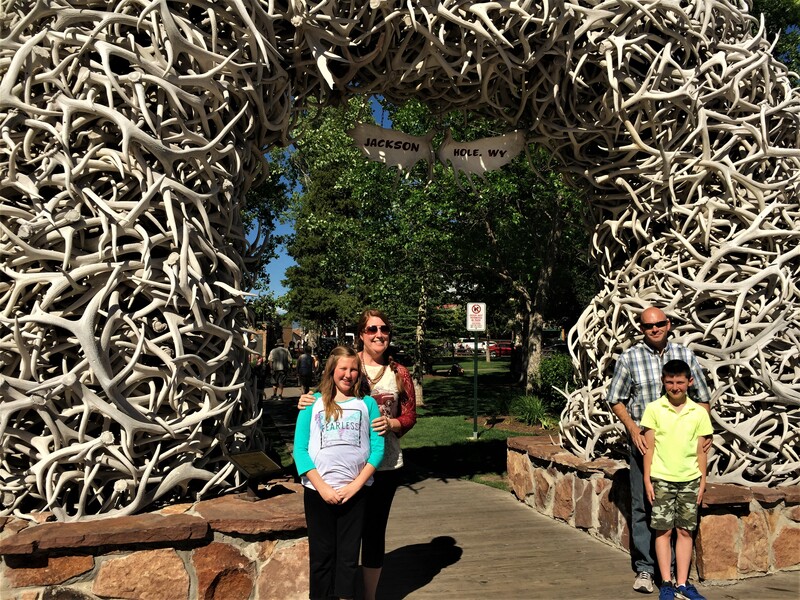 Of course, the first thing you will want to do is take a picture standing under an arch made of elk horns. The arches can be found at each corner of the square. You may have to wait in a short line to stand under the arch, but this photo opportunity is worth the wait. The square is a nice place to sit and relax for a little while, and, if you are lucky, there may even be a few entertainers performing around the square. The Town Square Shootout was the highlight of our day in Jackson. There has been a shootout in the square since 1957 and it is the longest, continuously running gunfight in the United States. 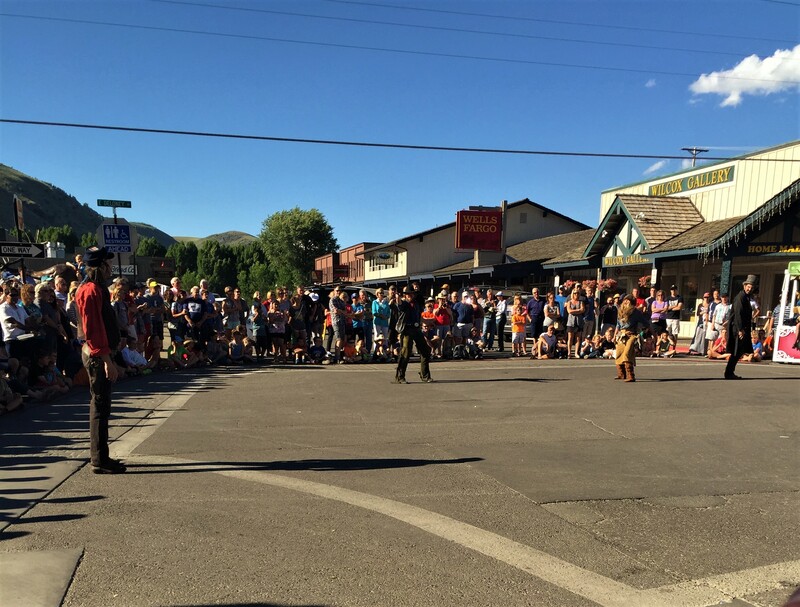 This free event is put on by the Jackson Hole Chamber of Commerce and the Jackson Hole Playhouse and can be seen everyday but Sunday. The action starts at 6:00pm, but be sure to arrive around 5:30 to get a good spot to view the fun. As some of the actors prepare the scene, others are walking around interacting with the kids. Our kids loved having several of the actors come over and talk with them before the show. Watching the antics of the “Jackson Hole Shootout Gang” is quite entertaining, and our kids enjoyed it. Just when you think the fun is over, the actors all hang around to take pictures and talk with the kids. Several even gave the kids spent shotgun casings, which thrilled them to pieces! 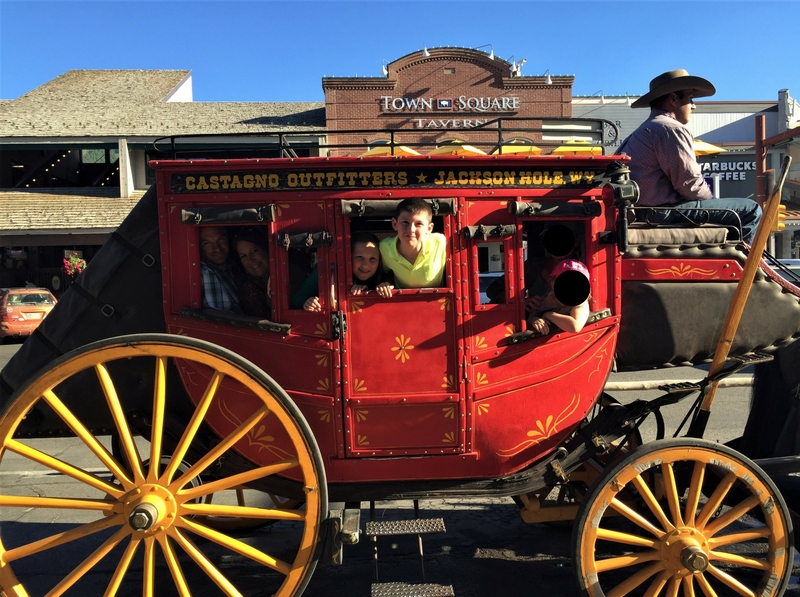 After the Shootout, we were in the Old West mood and decided to take a tour of downtown in a stagecoach pulled by mules. This 10-minute ride was short but enjoyable. It cost $21 for the four of us to ride around town. The kids were excited to ride in a stagecoach and had fun petting the mules when we finished the ride. The stagecoach station can be found in the wooden shack on Town Square at the corner of Broadway and Cache. With all this entertainment, we were starting to get a little hungry and headed over to Liberty Burger. We each had cheeseburgers, and we were very pleased. The onion rings and sweet potato fries were tasty as well. Although we did not try one, the shakes looked amazing and several others around us were partaking. The burgers were huge, and we probably could have shared one, especially since we had already scoped out our next stop, Moo’s Gourmet Ice Cream! This cute ice cream shop boasts that they only use 100% organic cream, 99% organic fruit and only 1% cane sugar in their ice cream and sorbets. 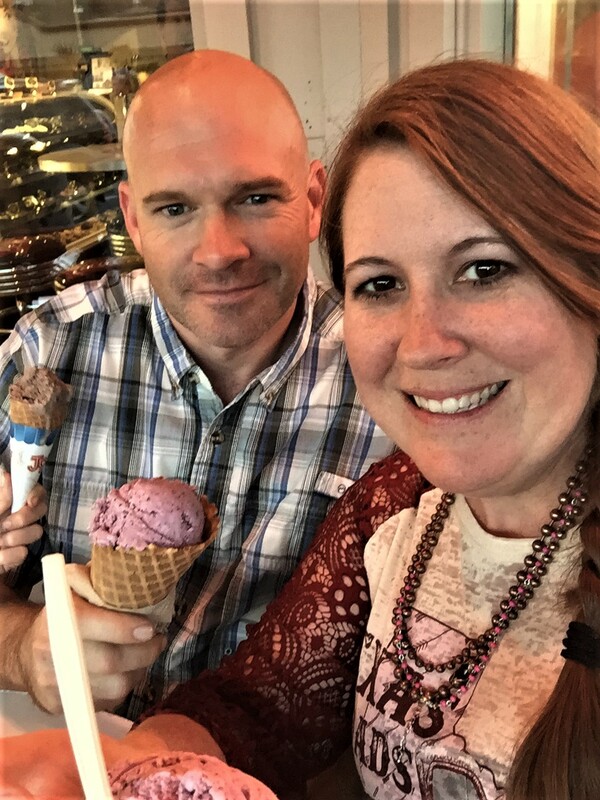 In 2013, Food Network chose the best dessert for every state and Moo’s Wild Huckleberry Ice Cream was chosen as the best for the state of Wyoming. Who could pass up the state’s best dessert?! Wild Huckleberry in a waffle cone for each of us! We were able to find a small table outside on the porch to sit, enjoy our ice cream and people watch. Each time we walked past Moo’s there was a line out the door, but it went quick and was well worth the wait. Since it was getting late, we decided to head back to the RV park and do a little wildlife watching along the way. We were sad to say so long to Jackson and wished we could have spent several days in town. 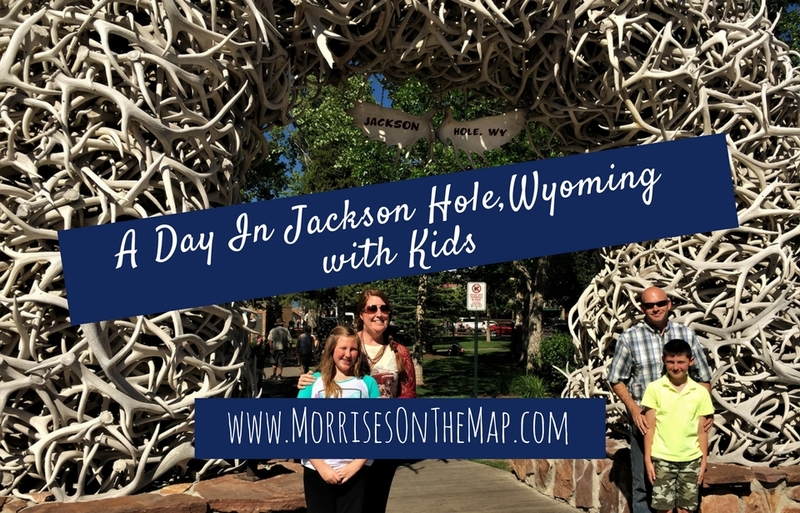 There were so many things we wish we could have done, and we can’t wait to mosey on back to Jackson, Wyoming, to enjoy more of all it has to offer! If you have an Old West experience in Jackson, we would love to hear about it! Happy Trails!